If you’re a wildlife fanatic like me, the variety of magnificent creatures to be found in Patagonia makes it the ideal place for an outdoor adventure. From the apex predator: the Andean puma, to the gargantuan humpback whale, with a whole plethora of weird and wonderful birds and mammals in between. 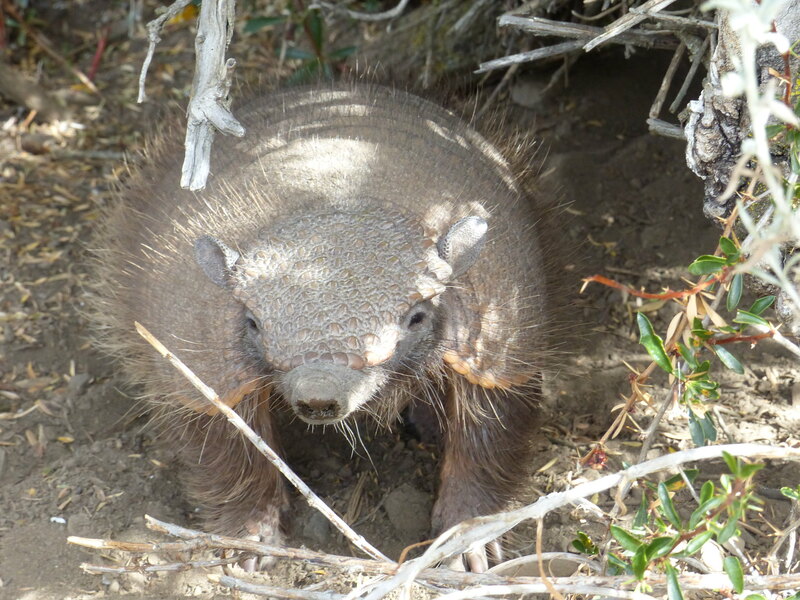 During my trip to Patagonia in April 2016, I was thrilled by sighting five pumas in one day, 34 humpback whales in two days, not to mention scuttling hairy armadillos, snuffly hog nosed skunks, hilariously clumsy penguins, and magnificent birds of prey. Another bonus is that there is nothing too creepy or dangerous down in Patagonia either – even the pumas regard us humans as rather insignificant: neither a threat nor a meal! There are no dangerous snakes or spiders, and very few mosquitos. So here’s a quick rundown of my top 5 wildlife experiences in Patagonia. I hope it fuels your love for Patagonia as much as it has mine, and inspires you to go out there and see it for yourself! With a degree of caution at first, he sidled out of his cosy looking burrow, snuffling around for juicy bugs. Finally, he emerged fully, and walked up to me within about half a metre. They have terrible eyesight and I don’t think he even realised I was there! I’ve been a total big cat nut for as long as I can remember, and although I’ve been lucky to spot lions, cheetahs, leopards and caracals in South Africa, spotting pumas in Patagonia is a totally different experience. They are very elusive creatures, that are both solitary and magnificently well camouflaged against the sand coloured rocks and earth of the Patagonian landscape. I only had two days (which in Puma tracking terms really only meant one evening and one morning) with an expert guide to try and spot one. Knowing how hard it can be to track them down, I didn’t set my expectations too high. The first afternoon/ evening was spent exploring the private land of Estancia Laguna Amarga. It was not until we returned back to the ranch just before dark, that someone came dashing in to say that a female with two cubs had just walked right past the estancia on the other side of the road! Unfortunately they had sloped off into the darkness by the time we had arrived, but it gave us new hope for the next day. Departing in the pitch black early the next morning, we reached Laguna Amarga in time for sunrise. After exploring for a few hours we had almost given up (the pumas head for their siesta around 10am), when all of a sudden my guide reached for his binoculars; he had spotted a female with two young cubs, making their way up the ridge to our left. Then, just five minutes down the road, another female, this time with one older cub. I could not believe my luck to have seen five pumas in ten minutes! 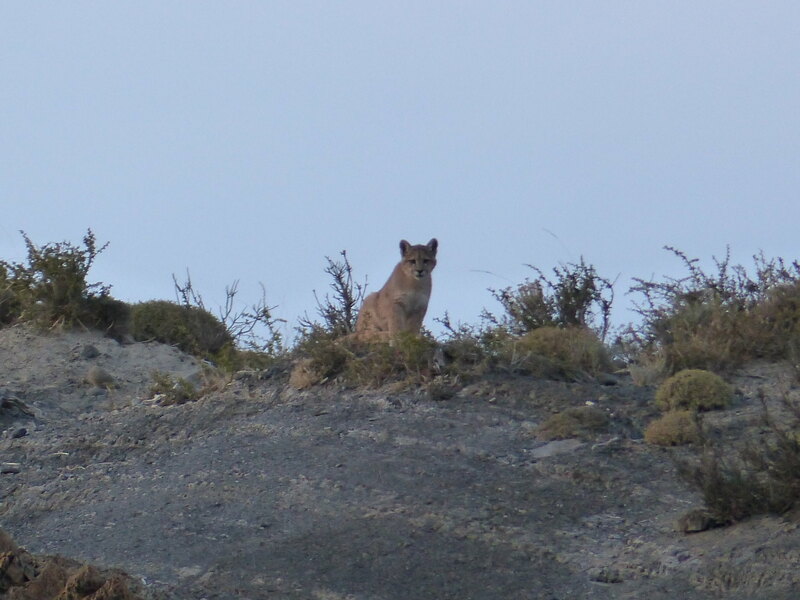 It spoke volumes though about the expertise of our local guides, and the health of the puma population of Torres del Paine. Two females with cubs sharing the same territory is a very encouraging sign. I left feeling extremely fortunate, and full of hope for the future of these pumas. Whales are a particular favourite marine species of mine, I’m fascinated by their mystery: their sheer size, their intriguing songs and apparent sense of family bonds / community. After eight hours navigating the choppy waters of the Magellan Strait in a small but fairly comfortable boat, I was pleased to make it to the more sheltered waters of the Barbara Channel. Here, a family of around 10 humpback whales were gathered and could be observed several at a time, blowing clouds of spray into the air, and showing off their dorsal fins and tail flukes. 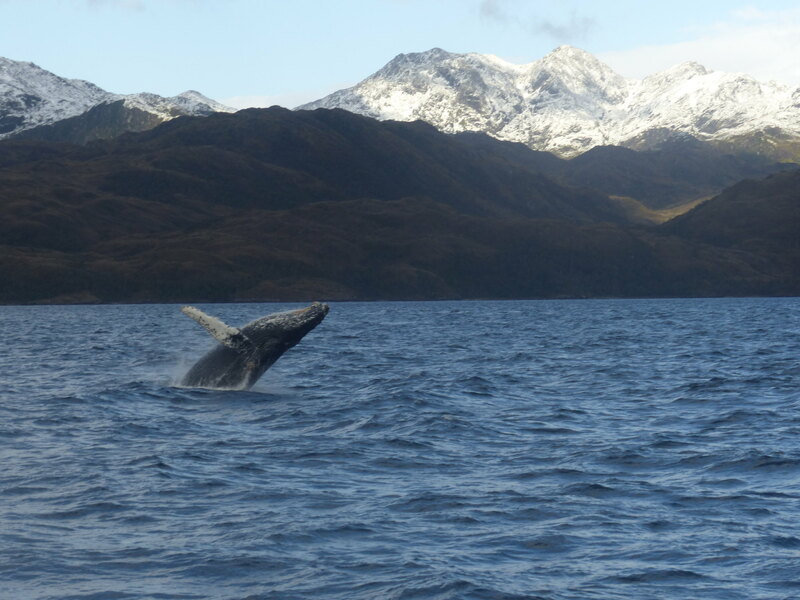 Humpback numbers have been increasing in these waters year on year, since whaling was banned. Many of the same individuals return each summer to feed in these calm and fruitful channels – I saw more than 30 individuals across those two days. 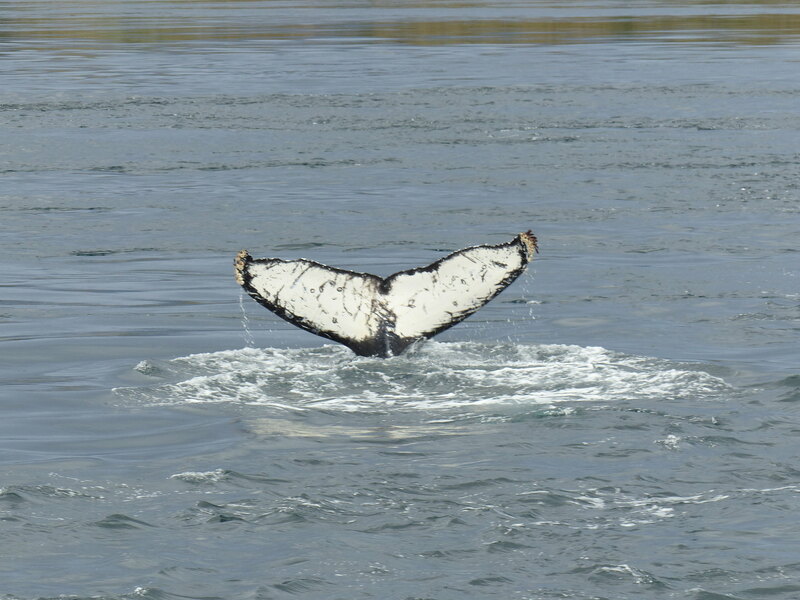 Read more on Whale Watching in Patagonia. 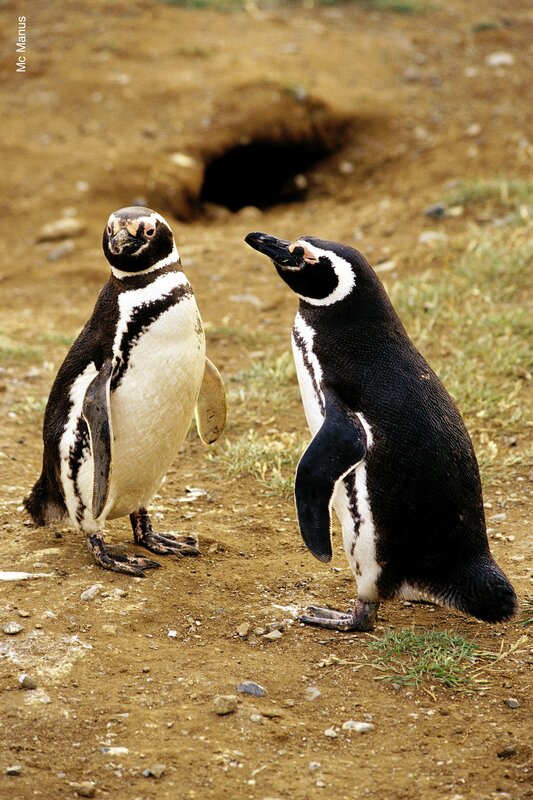 At Tucker Islets during my cruise from Punta Arenas to Ushuaia, I got to experience the sheer comedy value of Patagonia’s Magellanic penguins. Waddling around seemingly aimlessly, going for a quick dip in the icy water, sunbathing to warm up afterwards and clearly bickering with one another, these penguins quickly had me hooked! We were able to sail around a network of small islands in the Chilean Fjords, in small zodiac boats, and although we were not able to disembark and walk among the penguins (the islands are protected), you get within feet of them as they waddle along the shore line. There were so many unusual shapes, sizes, breeds, colours, and behaviours of bird to discover in Patagonia. 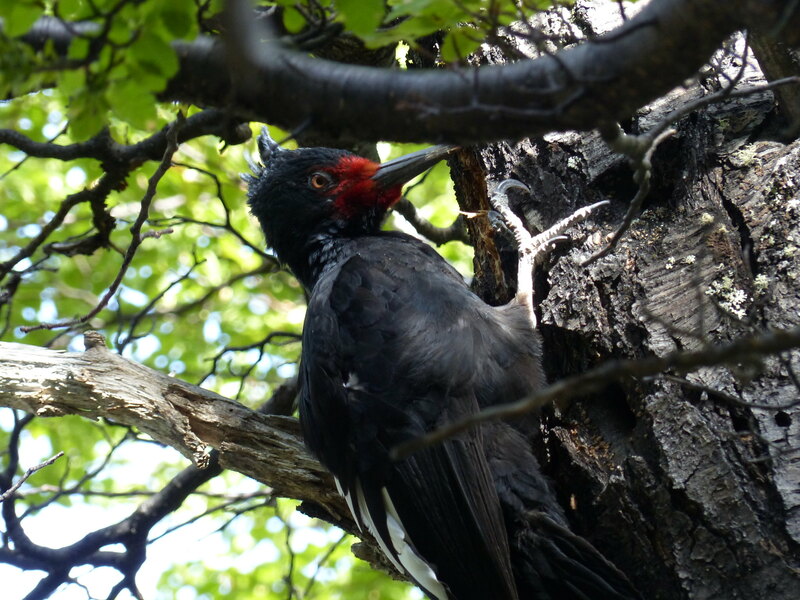 I was particularly keen to see was the Magellanic woodpecker, and whilst casually hiking through the Nothofagus forests in the Los Glaciares National Park, I was stopped in my tracks by the sound of tapping. I looked up and just a metre from my head, there was the gorgeous red and black woodpecker, busily tapping away at the tree trunk! 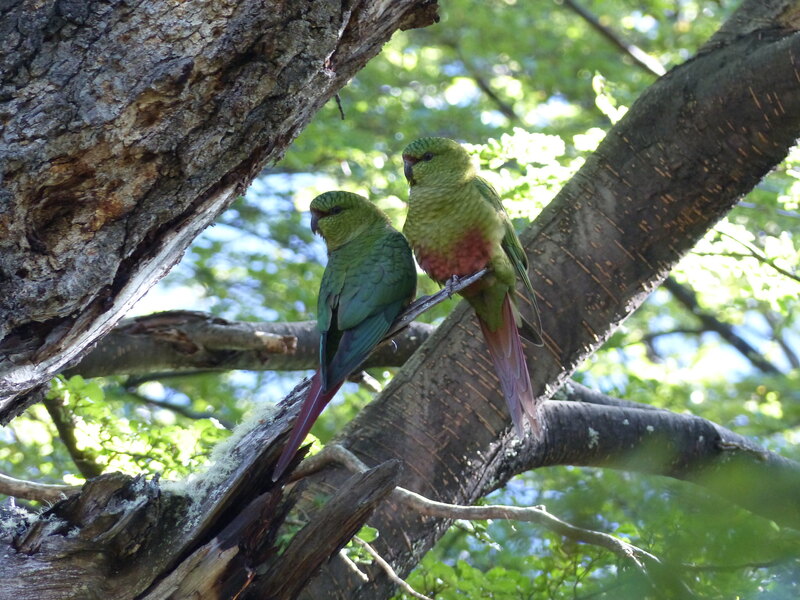 Not far from here, I also saw a gorgeous pair of vibrantly colourful Austral parakeets, all loved up and chirping away in the treetops above me. 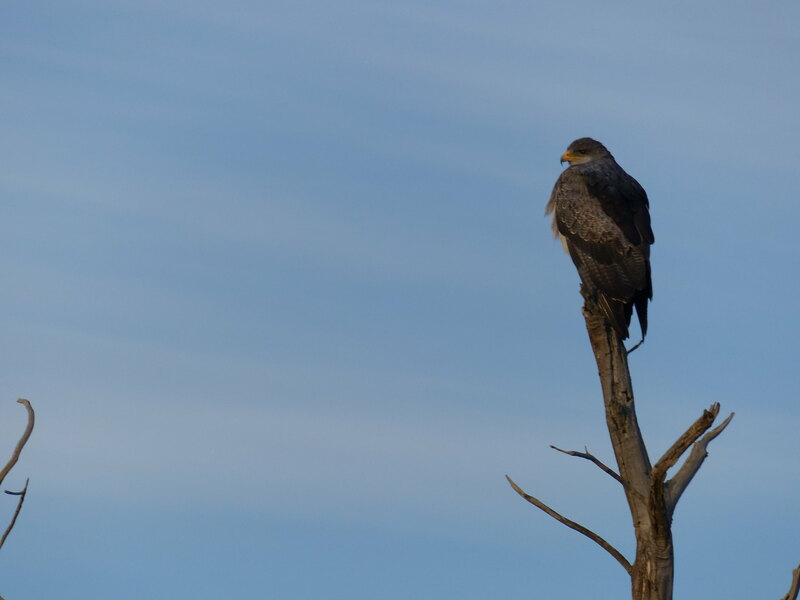 I also spotted this majestic chimango caracara perched in a dead tree scouting for a dinner of mice. In three weeks, I visited some of Patagonia’s most iconic sights including a visit to Perito Moreno glacier (where I did an ice-hike) and horse-riding on the Patagonian steppe. I kayaked and cruised my way along some beautiful stretches of water and of course I visited the iconic towers of Torres del Paine, witnessing the most amazing sunrises and sunsets. Read more about my incredible Patagonian adventure. Get in touch with Swoop who can help you make your wildlife adventure dreams a reality and browse the wealth of wildlife information we have on our website. This entry was posted in Wildlife and tagged penguins, Whale Watching, Whales, wilderness, wildlife on 19th May 2016 by Chloe O'Keefe. A few of the people who contact Swoop have visited Patagonia before and are looking to go back and explore it further. After all, a region that spans 1,000 miles North to South and 1 million square kilometres, with landscapes ranging from glacial to volcanic, to rainforest and desert, probably deserves more than a fortnight of our attention! So, we thought we’d share some ideas for things to do if the W Circuit has whetted your appetite for Patagonia and now you’re looking for more. First of all, within Torres del Paine National Park what are your options after the W Circuit? 1. Surprisingly just 5% of visitors to Torres del Paine trek the Full Circuit of the park. Yes, it takes around 8 days and the hikes between the Refugios are significant, and, yes, Paso John Garner is very windy and yes it’s a steep descent down to the Grey Glacier. But the rewards are so great. 8 days of spectacular hiking in such varied terrain; nights of camping in sites that are so much quieter and less developed than those of Grey, Campamento Italiano or the Paine Grande Lodge; the incredible views out to the South Patagonian IceCap from Paso John Garner, and experiencing the unbelievable force of the Patagonian wind; the wonderful descent down to and along the Grey Glacier. If you have the time and the stamina don’t miss the Full Circuit. 2. If you want to get off the beaten track, the Pingo Valley provides some wonderful hiking in a quiet part of the park. The valley is certainly not on the same scale as Frances or Ascensio and is probably more appropriate as a warm-up or preface to your main hike, but it’s stunning nevertheless: up the valley through steep canyon walls, dense forest, and past the immense power of Cascada Pingo, and up to a wonderful campsite on the shores of the river, where there are no facilities and minimal signs that anyone has been there before. This acts as a base for two hikes: one to the Pingo Glacier itself (subject to you being able to cross the river), and up to the Zapata viewpoint (sadly the Zapata Glacier has receded significantly, but the viewpoint remains very impressive). If you are lucky, you may also catch a glimpse of the rare Huemul. 3. Hike from Lago del Toro to Paine Grande Lodge (Lago Pehoe). This is gentle hike in the southern part of the park with no major ascents but walking predominantly north you walk with the Cuernos and the Towers ahead of you for most of the way. Starting out from the Administration Centre we saw Condor on the early part of our hike, and the final kilometres along the shores of Lago Pehoe are beautiful. You can also cover most of this route on horseback. 4. The Rio Serrano makes for a wonderful exit from Torres del Paine National Park. Starting out from Camping or Pueblito Serrano you can either kayak or go via zodiac boat, following the river all the way down to Puerto Toro, which sits at the junction of the Serrano River and the Last Hope Sound (Ultima Esperanza Fjord), and alongside the Serrano glacier with its steep descent into a lagoon. If you kayak downstream, you can camp on the shores of the river, and possibly do a day’s extension to the Geike glacier. 5. On the W Circuit you will have walked along the northern shore of Lago Nordenskjold at the foot of the Cuernos and the Towers. However, you can also hike on the southern shore, where your perspective of the peak is enhanced and you are more likely to come across some of Patagonia’s fauna – guanaco, condor, huemul. If you have further ideas or questions for us then please let us know. This entry was posted in Things to do and tagged adventure, Hiking, patagonia, Torres_del_Paine, Tours, wilderness on 7th February 2011 by Luke Errington.